If you're shopping for a Pucca Halloween costume, you'll find that there are surprisingly few options available online. 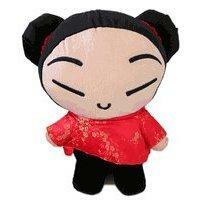 However, it's easy to dress up as Pucca for Halloween when you make your own costume. Pucca is an animated character created in South Korea. She is a ten-year-old girl, and her father owns a noodle restaurant. She's in love with Garu, a 12-year-old ninja who lives nearby. The Pucca television show and merchandise are distributed by The Walt Disney Company. Pucca's trademark is her hairstyle, which consists of two perfectly round, smooth, black ponytails, which are tied with red ribbon. She also sometimes wears a flower in her hair. Her shirt is bright red, and she wears simple black pants. Her cheeks are painted with two round rosy spots. As far as Halloween costumes go, Pucca is a great choice for adults or children. The costume is simple and easy to create, which means it is perfect for last minute parties or if you're short on time this Halloween. You can make your own Pucca costume and accessories in a matter of minutes. Pucca's clothing is simple and easy to duplicate. To get started on your Pucca costume, search through your closet for a pair of tight black pants or pick up a pair of black leggings. Either find or buy a red shirt to complete the outfit. The shirt should be a simple top or turtleneck with a loose fit. The most important element of the costume will be the hairstyle. Pucca's hair is her trademark. The hairstyle is a key part of the costume, and it's what will help others identify you as Pucca. Fortunately, it's easy to make a Pucca wig. Start by buying a very basic black stocking cap that fits you or your child. The cap should be as simple as possible. Try to avoid cable knits or any kind of pattern. Next, buy a small amount of matching stretchy black fabric. For a perfect match, you could purchase a second stocking cap and disassemble it to get the fabric you need. However, any stretchy black fabric will work. Cut the black fabric into two circles, approximately eight inches in diameter. Place a foam ball in the center of each circle, and gather the fabric around it. Tie the fabric with a rubber band. You now have two round black balls. Carefully make two small slits in the sides of the hat. Push the gathered ends of the black fabric balls into these slits and sew them to the hat. Wrap red ribbon around the places where the black ponytail balls meet the hat. If desired, add a flower to one ponytail. No Pucca Halloween costume is complete without rosy cheeks and a fun-loving attitude. In your Pucca costume, you're sure to make everyone else have a fun-loving attitude too.